It’s easy-peezy to find us! To get to us from Auckland Airport, we recommend Discount Taxis approx $40 airport special (09 529 1000), Black Cabs approx $45 (09 620 7070) or the shuttle service (approx $25pp) or the Skybus ($16 pp if purchased in advance online – or $18 on the bus) to the Downtown ferry building on Quay St.
On arrival at Waiheke you will find taxis and buses waiting. Taxi prices vary, so you will need to enquire. Buses don’t hang around, so don’t take too long in the terminal! The number 2 bus to Palm Beach/Rocky Bay is a good option (buses are all $3 pp). 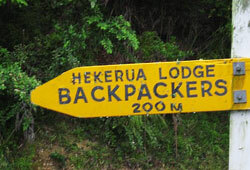 Get off at the stop for Hekerua Lodge just past Little Oneroa Beach at the top of Goodwin Avenue and we are a 5 min walk down Hekerua Road – check the map! Note: all pricing and info quoted is correct as of publishing date, but these may change, so please enquire with the relevant provider to be sure! If you need any help or information before or after you book – get in touch on the below phone number, or scroll down to send us an email!